Most preschoolers are all about learning the letters that make up his/her own name. 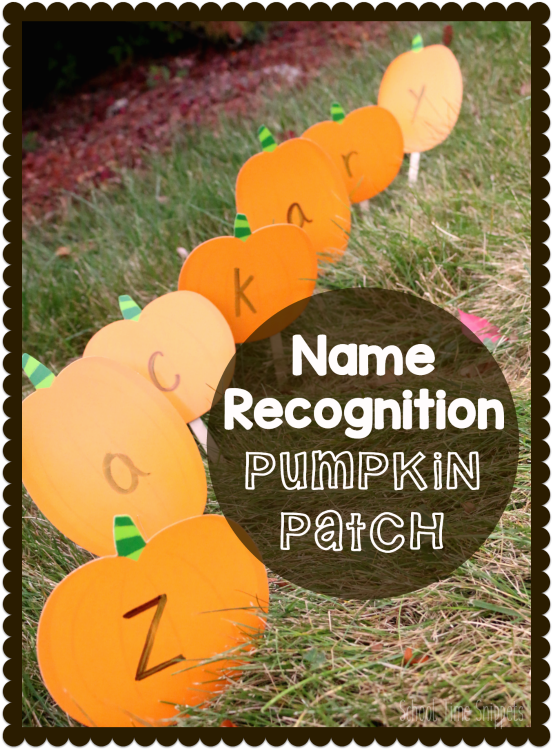 As pumpkin season abounds, play this fun Name Recognition Pumpkin Patch Game! Your preschooler will love it! Calling all pumpkins!! This seasonal name game for preschoolers is perfect for fall! Your preschooler will love picking through the pumpkins to find the letters that make up his/her name. 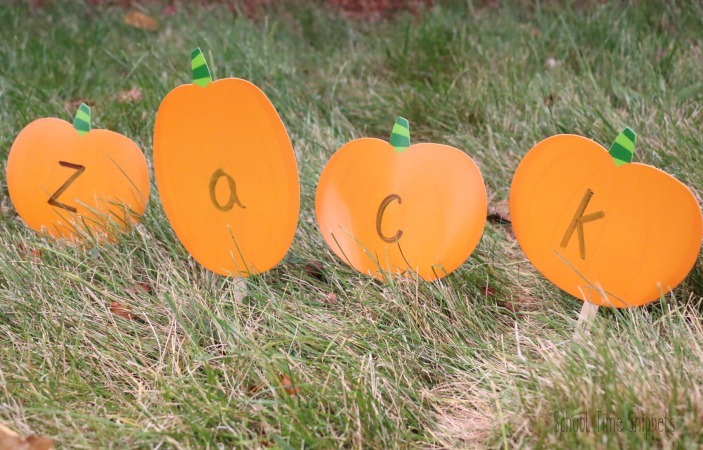 This Name Recognition Pumpkin Patch is a great way to get your preschooler moving and learning letters in a hands-on way! 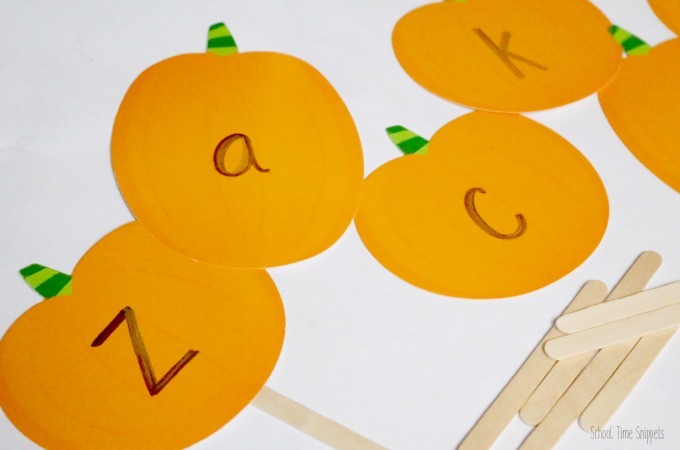 I chose to use a pack of left over pumpkin cut-outs I had used to make our ABC Pumpkin Matching Puzzles, however, as I am writing this up, another fun way to do this activity would be to use little mini pumpkins and write a letter on each one! Use which ever way suits your fancy-- they will both be fun, nonetheless!! Begin by writing a letter of your child's name on a pumpkin. For a challenge, include letters that do not belong in your child's name. Tape a popsicle stick to the back of each pumpkin. With the pumpkins all ready to go, head outside and create a pumpkin patch. Stick the pumpkins into the ground all over the yard. When the pumpkin patch is all set up, encourage your child to find the pumpkins to spell out his/her name!! Either call out a specific letter for your child to look for, or see if he/she can put the letters in the correct order all by themselves. You could also write the child's name in chalk nearby so that they have something to self-check against. As the child finds the letters in his/her name, have them place them into the correct order. To reinforce the letters, have the child point and say the letters in the order they appear in their name. And, since our pumpkin cut-outs consisted of two different sizes, we were able to extend learning by talking about big and little and sorting the pumpkins into two groups, too. Such a fun and cute way for your preschooler to learn the letters in his/her name!! 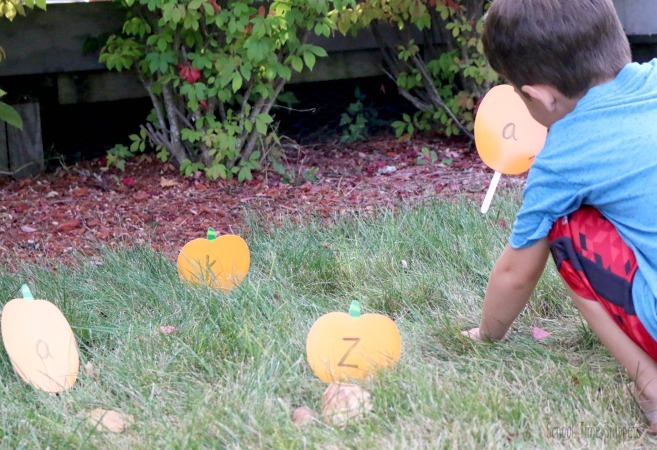 Turn name recognition for your preschooler into a fun game with this Pumpkin Patch Name Game! !